Unlike many of the new people who have come into the sport of karting later in their lives, I’ve been around it since the day I was born. When my Dad and his father went looking for something to do together back in 1974, they found karting. Today, it’s something my father and I still cherish every day of our lives. Racing is part of our family and karting is in our blood. If they wish to follow in our path, I can’t wait to get both my kids involved in the sport and make it a full-family hobby. Over the past four years, however, I’ve been focused on building that family. My son was born in late 2007, we bought our current house in 2008, and we welcomed our daughter into the Cole clan in late 2011. Looking back 10-15 years ago, I used to mock the guys who stopped coming to the racetrack because of this excuse and that excuse. But now, I find myself stating the same reasons for my absence from competition. 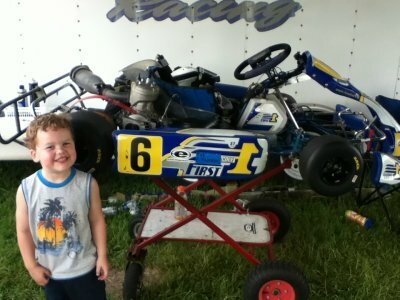 In 2011, I went the entire season without racing or even sitting in a kart. 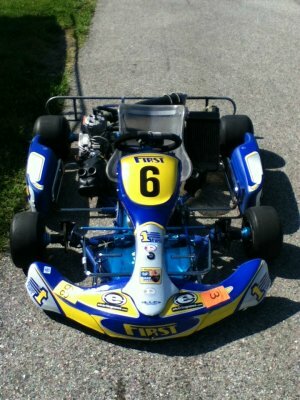 It was the first time I had not competed in a kart race since 1995. Looking at the big picture, I have a great family, a home, an exceptional job, and everyone is healthy. There’s not much to complain about, except a little piece of who I am was missing. I needed to get back behind the wheel. With the help of my Dad loaning me his kart, and some help from HMG Motorsports (EKN’s racing division), I entered the WKA National Road Racing Series event at my home track, Grattan Raceway in Belding, Michigan. For years, I made the 30-minute trip to the picturesque 2.0-mile course, half of them watching my family race and the other half racing myself. As one person asked during my race weekend – “how many laps do you have around this place?” – I couldn’t even think of a number that would adequately answer that query. I’ve simply lost count. So, after a couple late nights in the garage and at the track on Thursday putting the finishing touches on my kart for the weekend, I was on-track on Friday morning for my first laps in nearly two years. Just slapping down the visor and pulling onto the track, I got goose bumps and had the biggest smile on my face. Overheating issues quickly altered my mood as I sorted out the problem. After some changes, we discovered the water pump was not working to properly cool my Parilla Leopard TaG engine. Once we were able to see comfortable temp readings on my gauge, I took on the final two sessions of the day to see where I stood on lap times and where the setup was in terms of being close to what I needed to run up-front. Without any changes, and 4-5 weekend old Bridgestone YKC tires, I was two seconds quicker in the same kart/engine from 2010, on Grattan’s resurfaced track. Saturday warm-up was taken with newly-mounted MG Tires – thanks to DRT Racing – and more teeth were piled onto the rear sprocket, and I was into the 1:29 window without the draft and I was feeling good. Racing in the Stock Leopard class, I was gridded first of four. From the LeMans standing start, I fell back to third but held onto the lead draft. After two exciting laps as we sorted things out, I slotted into second and was just biding my time for the 30-minute race when I made the trip over the famous Grattan ‘hump’ on the back-straight and lost the chain. Sitting from the sidelines, I was disappointed, but with the family there watching, I just glad that we were all back at the track. Getting the kart back to the pit, we found the motor mount bolts had become loose and backed out, detaching the motor from the vibration plate (which the corner worker found) and the motor mount itself. Thankfully, I was able to rethread the engine and get everything back together overnight to race on Sunday without any real damage. Warm-up went on with no issues, and I ended the session eager for the race. On the grid third, it was the same trio at the front once again with myself, former EKN Road Racer of the Year Anthony Honeywell and old personal favorite driver Sean Sholtis – who I watched as a kid. Each of us were quicker than the other in certain areas of the track, until eventually I was in the lead with Honeywell second and Sean third. We settled in as we made our way through traffic. I eventually got caught up by a competitor in another class, and Honeywell worked by for the lead and I had some catching up to do. Down the front straight on the same lap, Sean came alongside and motioned to the radiator. Looking down, I found the gauge showing 260 degrees for the water. I nursed it around as fast as I could, pulling into pit lane. The water pump belts had snapped off and after replacing them and adding some extra water to the radiator, I was back on track to finish the remaining eight minutes. While the race did not end as hoped (two laps down), I managed to race for the lead, record my fastest lap in the kart at the track (1:28.09), and had a blast just racing again. Reviewing the weekend and the current state of the sport, three things seem to be the biggest issues road racing is facing today: a true entry-level program, travel costs, and schedule conflicts. We need a way to get people into road racing and get the industry behind it, which is very important for the discipline to continue. Reviewing the national schedule, I don’t see how regular racers can make all eight national events in one season without having to stretch their budgets out even further. In order to reduce travel costs, I believe that we need to review how the season schedule pans out, to offer plenty of races for those who can afford it, and minimize any conflicts in doing so. Later this summer, I’ll go into these subjects further. In closing, I’d like to thank all those volunteers and workers, not just at the Grattan event but across the country, who help put on events and spend countless hours providing us with events at which to compete. Without their commitment, we would not have places to race and we’d be missing out on all this fun. Later this summer, we’ll have more about our Entry Level Program where I’ll be back at my home sprint track for the first time since the late 1990s.